The lining of the appendix continues to produce mucus. It has no place to go. Bacteria normally found in the intestines buildup and make toxins in the lining of the appendix. Pressure builds and causes severe pain in the abdomen. The wall of the appendix can break open. The contents of a ruptured appendix can spill into the abdominal cavity, which can lead to a life-threatening infection called peritonitis . Appendicitis needs to be treated right away. Appendicitis is more common in men and teenagers. You are at increased risk of developing appendicitis if you have family members who have had appendicitis. If you have severe pain in the abdomen, get medical help right away. Appendicitis can be hard to diagnose. Symptoms vary and can be similar to symptoms of other diseases. 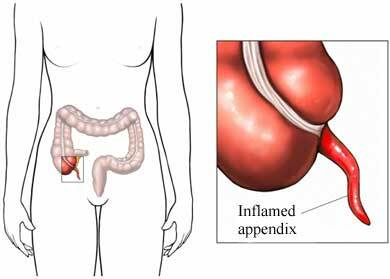 The main treatment for appendicitis is a total appendectomy . It is usually done as soon as possible. Uncomplicated appendicitis can be treated with antiobiotics. There are no current guidelines to prevent appendicitis. It starts quickly and the cause is usually unknown. Get medical care right away for severe abdominal pain. It will decrease the risk of rupture. Appendectomy. American College of Surgeons website. Available at: https://www.facs.org/~/media/files/education/patient%20ed/app.ashx. Updated 2014. Accessed January 9, 2018. Appendicitis. Merck Manual Professional Version website. Available at: http://www.merckmanuals.com/professional/gastrointestinal-disorders/acute-abdomen-and-surgical-gastroenterology/appendicitis. Updated January 2017. Accessed January 9, 2018. Appendicitis. National Institute of Diabetes and Digestive and Kidney Diseases website. Available at: https://www.niddk.nih.gov/health-information/digestive-diseases/appendicitis. Accessed January 9, 2018. Appendicitis in adolescents and adults. EBSCO DynaMed Plus website. Available at: http://www.dynamed.com/topics/dmp~AN~T115548/Appendicitis-in-adolescents-and-adults . Updated October 25, 2017. Accessed January 9, 2018. 7/13/2007 DynaMed Systematic Literature Surveillance http://www.ebscohost.com/dynamed: Styrud J, Eriksson S, Nilsson I, et al. Appendectomy versus antibiotic treatment in acute appendicitis. a prospective multicenter randomized controlled trial. World J Surg. 2006;30:1033-1037. 5/27/2014 DynaMed Plus Systematic Literature Surveillance http://www.dynamed.com/topics/dmp~AN~T115548/Appendicitis-in-adolescents-and-adults : McCutcheon BA, Chang DC, Marcus LP, et al. Long-term outcomes of patients with nonsurgically managed uncomplicated appendicitis. J Am Coll Surg. 2014;218(5):905-913. 6/23/2014 DynaMed Systematic Literature Surveillance http://www.ebscohost.com/dynamed: Choosing wisely. EBSCO DynaMed website. Available at: http://www.dynamed.com/topics/dmp~AN~T905359/Choosing-Wisely . Updated July 23, 2015. Accessed January 9, 2018.